Small Compact Portable Washing Machine - Twin Tub Washer & Spin with 12.12 Lb. Wash Capacity & 7.7 Lb. 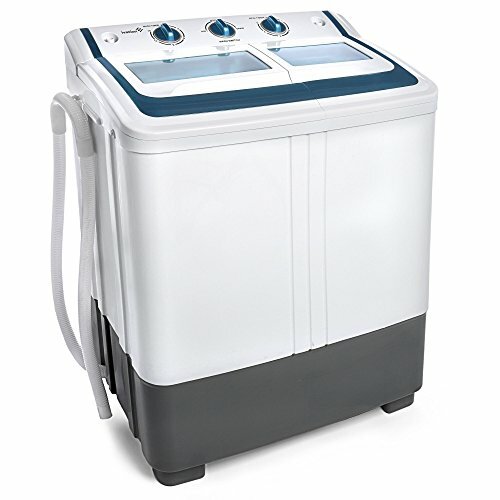 Spin Capacity - Includes Drainage Pump & Tube - Ideal for Dorm Rooms, RV & More..
12.12 Pound Wash Capacity & 7.7 Pound Spin Capacity; Dual Function Design Allows Simultaneous Operation..
Intuitive Interface Includes Washing Timer, Wash Selector & Spin Timer; Simply Fill, Plug In & Set Cycle. Portable Tub is Great for Compact Spaces Like Apartments, Condos, Dorms, Guesthouses & Motor Homes..